REVEL Big Cottonwood is excited to offer a wide range of vendor opportunities that provide access to a highly-targeted demographic at a very low cost. Pricing has been kept low in order to ensure accessibility. REVEL Big Cottonwood is one of the fastest-growing running events in the country. We continue to experience unprecedented growth, and anticipate participant numbers of 5,000 this year, with an anticipated crowd size of 15,000. Booth maps. Booth space is reserved on a first-come-first-serve basis. 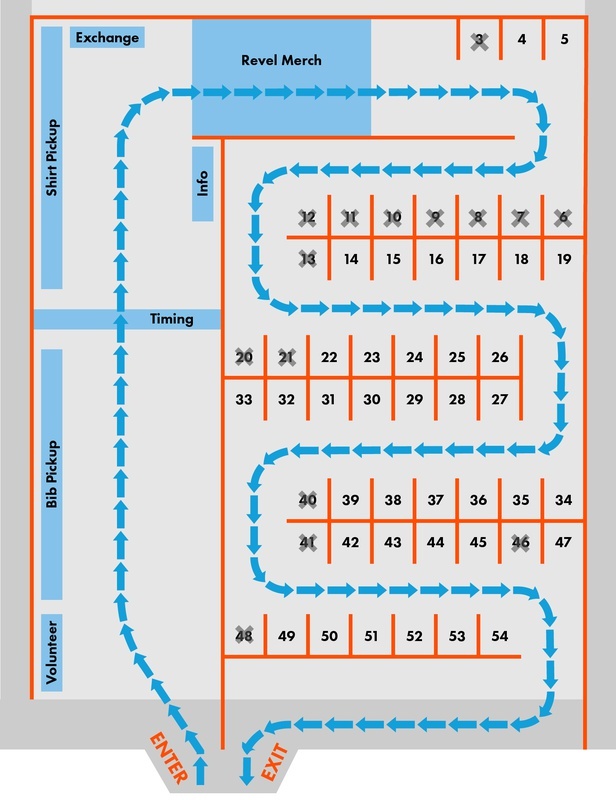 Maps of booth space available at the expo and the finish venue can be viewed below. Please indicate your top three choices for booth space in the comments box at the bottom of the page. Expo. The REVEL Big Cottonwood Expo will be held at a TBD location on Friday, September 13, 2019, from 10:00 AM until 8:00 PM. Additional details including setup and our expo service kit will be emailed once payment is received. Finish line. The finish line is located at 1265 E. Fort Union Boulevard in Cottonwood Heights. Setup time for booth space at the finish line is from 5:30-7:30 AM on Saturday, September 14. The event will conclude around 1:00 PM. Additional details will be emailed once payment is received. Swag bags. We offer physical insert race bag placement. Items must be received no later than September 6, 2019 to be included in the race bags. Additional information about shipping and drop-off will be emailed once payment is received. The Vendor agrees that once received, payment is final and may not be refunded for any reason, including the vendor’s inability to attend or missing deadlines for the provision of swag bag items. The Vendor agrees to provide proof of general liability insurance of at least $1 million per occurrence and in the aggregate, which includes Brooksee, LLC (11968 N. Ithica Drive, Highland, UT 84003) as an additionally insured certificate holder, no later than August 31, 2018. Food vendors must also provide proof of food handling permits by August 31, 2018, and also bring their food handling permit to the event. The Vendor understands that failure to provide proof of insurance and food handling permits (where applicable) by this deadline will result in loss of booth space with no refund. The Vendor understands that the use of the name REVEL Big Cottonwood, Big Cottonwood Marathon & Half, and/or any of their affiliated logos, is prohibited without express written consent. The Vendor, on behalf of himself/herself and on behalf of the Vendor’s personal representatives, assigns, heirs, and executors, hereby fully and forever releases, waives, discharges and covenants not to sue Brooksee LLC, Salt Lake County, the South Towne Expo Center, the City of Cottonwood Heights, the City of Holladay, the Utah Department of Transportation, USATF, any agencies whose property and/or personnel are used for staging, course route and support, official race parking, or finish venue, and any other sponsoring or co-sponsoring companies, individuals, and volunteers related to the Race (collectively, "Releasees") from all liability to the Vendor and his/her personal representatives, assigns, heirs and executors, for all loss(es) or damage(s) and any and all claims or demands therefore, on account of injury to the Vendor or property or resulting in the death of the Vendor, whether caused by the active or passive negligence of all or any of the Releasees or otherwise, in connection with the Vendor’s involvement with the Race. The Vendor hereby assumes all risks of loss(es), damage(s), or injury(ies) that may be sustained by him/her during his/her involvement with the Race. The Vendor warrants that all statements made herein are true and correct and understands that Releasees have relied on them in allowing the Vendor to be involved with the Race.